We agonised about going to the Peaks or staying here. Andy Wallis was a bit down on the Peaks due to possible spreadout, but here it was going to be windy. I didn’t mind, I was happy with another rest day after Slovenia. It was howling in the garden, but Martin was at Corndon and said it was top-end but flyable, so we ambled up at 11.30am, to see Martin getting high, but coming back forward. It seemed windy so we sat around for a bit and watched the Joint Services comp guys, who didn’t seem to have too many problems pushing forward. Martin, Kai, Geoff and the SW/Mid-Wales guys got off together and climbed out, but I missed my chance when I had to fix my speedbar and then fluffed a launch. I had my one tricky bit of the flight behind Builth, where I had a short bit of blue, and had to fly over a quarry to find the thermal, but I did, and was off again. By then I could see Brecon on my GPS and I thought if I can just get there, I’ll have done 80km and that would just be brilliant. So I set myself the goal of not landing before I got to the town. Once I got high near there, I spotted the sea and that was a huge motivator, but the Brecon Beacon mountains were in the way. I dithered for a while, trying to decide if I really wanted to fly into the mountains with so much wind (the answer was ‘no!’) so I changed track a little and flew along the valley before the mountains, thinking that I would just extend my flight and land in a village at the end of the valley. On the way, I found a saddle I thought I could cross, with big flat moorland on top. If I bombed it would be a long walkout, but I thought it would be safe to cross there. I did a little wager with myself – if I got to base I would cross, if I didn’t then I wouldn’t. The thought of having the chance to fly to the beach was too tempting and I got to base halfway along the saddle. I topped up and was across the Becons! I indulged myself in checking how far I had come by doing a Go To on the GPS and saw I had come 91km. I watched as my GPS ticked over the 100km and did my usual happy tears bit. My first 100km! Anywhere. I was still high and some way from the actual coast, so I decided to see if I could get the record, which is presently 125km, set by Judy Leden in 2004. I got to Neath and then headed to Swansea. I got to 120km, but then ran out of landing options. Houses as far as I could see and loads of industrial stuff and water to cross to get to the beach, I chickened out and landed in the last playing field for miles. I had pushed the distance a bit, so did a full speedbar approach just to avoid a road and get into the field. It was howling on the ground. It’s not possible to describe how I felt, there are only a few occasions I think I have been so happy. Two young boys came to see if I was ok and I got them to help me pack up. I needed the assistance, it was so breezy. They pointed me in the direction of the local pub. 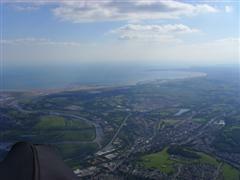 I had landed in one of the less salubrious parts of Swansea (according to Dave Thompson, I was lucky to get out of there with my glider), but lots of people had seen me land and were asking questions and congratulating me. When I got to the pub someone bought me a drink and suddenly loads of people started arriving in cars, bikes, quads, on foot, saying their mates had called then to say some woman had flown from the border at Powys and they wanted to check that it was true. More free beers later, they called the local newspaper! Luckily I was gone by the time they sent a photographer round. Geoff picked me up, after a short flight. We got back at midnight. There’s so many lessons I learnt in Slovenia and although I didn’t do well in the comp, everything that I did learn clicked into place today. And the most important thing to me was that for once, I didn’t make a mistake. You always make a mistake on a flight when you land before the end of the day or before you run out of land. I did neither yesterday. I landed at 6pm, after getting nearly to the beach. I missed out on the record, but I don’t mind. I flew the second longest flight any woman has done in the UK, and that’s enough of an achievement for me at present. And I did it nearly all on my own. Thanks so much to everyone who sent congrats and good wishes. It really means a lot to me! Nice one Judith – legendary stuff. Well done and congratulations, Judith – a brilliant effort. Awesome flight, well done Judith. nice one judith …. well done. Congratulations on your first UK 100km! Brilliant. Knew you could do it! you will find the next one is easier! Brilliant flight Judith! Congratulations on your first 100k and welcome to the Ton Club!! And a great report and pics too – sounds like it was an awesome flight over the Brecon Beacons. There is nothing better than running out of land and knowing that you’ve got as far as is possible on the day! Great flight Judith, I’ve not been been looking on here for a while and when I do I see your jostling for the Womens British record. Brilliant. I’d struggle to fly 20yds here, It’s been raining for two chuffing weeks now!!! What a trip Judith, as you know I’m only just getting into XC (work!!! !ah ah ah ah. not laughing) your blogs are really inspiring. Awesome Judith ….big Well Done! Well they’ve said it all but well done again. Fan-bloody-tastic Judith big goal Mole. 😉 . Next time a few more K’s and WooooHoooooo! Well done Judith, truly awesome flight! Well don. A great set of desishions made to bring in a great flight. Is it a site record to. Next stop the 200 club.